ORLive Presents: University Health Network and Toronto General Hospital Present a Live Mitral Valve Repair Webcast With Tirone David, M.D. TORONTO -- (MARKET WIRE) -- May 23, 2007 -- University Health Network's Division of Cardiovascular Surgery announced today that at 1 PM EDT (17:00 UTC) on June 4, 2007, Dr. Tirone David will conduct a live surgical webcast on www.OR-Live.com. Tirone E. David, O.C., O.Ont., M.D., F.R.C.S. (C), is the Head of the Division of Cardiovascular Surgery at the Peter Munk Cardiac Program, Toronto General Hospital, University Health Network (UHN). Dr. David has performed more than 1,500 valve repairs, and he was one of the first surgeons to introduce modern techniques of mitral valve repair in North America back in 1980. In 1993, he received the Order of Ontario, and in 1996 he was appointed as an Officer of the Order of Canada, Canada's highest civilian honor, for his "techniques in open-heart surgery and heart transplantation." Dr. David joined the academic staff of the University of Toronto and Toronto General Hospital in 1978. He was elected University Professor in 2004, the highest honor bestowed to professors at the University of Toronto. Established surgeons from around the world visit the Peter Munk Cardiac Program to learn more about the way they care for their patients. In addition, that center publishes numerous research reports each year. This adds to the professional knowledge and skill of fellow cardiac surgeons and helps to improve the treatment of all cardiac patients. University Health Network is home to one of the largest Cardiovascular Surgery Centres in Canada. 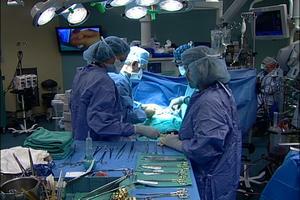 The Peter Munk Cardiac Program surgeons perform more than 2,000 operations per year. Their combined skill and expertise allows UHN to offer comprehensive innovative treatments for patients with complex heart conditions. These innovative techniques and treatments continue to generate the best clinical results for patients. Approximately 75,000 patients require some form of mitral valve repair each year. An additional 90,000 patients worldwide have mitral valves that cannot be repaired and ultimately are entirely replaced with prosthetic technology, composed of a metal or mechanical valve or using treated tissue such as porcine valves for implantation. In 2005, Dr. Tirone David, working with engineers from Medtronic, designed the Simplici-T® Annuloplasty System for use in mitral and tricuspid valve repair surgery to help restore the leaking valve opening to a more-normal shape. "The Simplici-T band restores proper valve coaptation and improves valve function after repair."